Samsung unveiled its 3D eco-system at CES 2010 today, and with it a bullish attitude to 3D in the home. Despite a number of other manufacturers beating Samsung's 3D announcement – notably LG and Toshiba – the company believes that it will become the number one manufacturer of 3D TVs, and notes that it will have the widest range of 3D TVs available at launch. Tim Baxter, Samsung President for the USA market, said about the company's 3D announcement: "3D has had a bumpy ride since it was around since 1922. Today, technology has improved dramatically. Hollywood has embraced 3D, and people want to see 3D in cinemas. "We are forging the future of home entertainment in a new dimension." 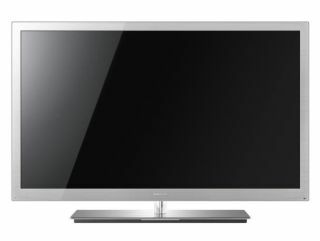 Proving that it is the manufacturer to bring 3D into the home, Baxter also noted: "Samsung is no stranger to 3D TV. We were the first in 2007 to show off a 3D TV and we were the first to show a 3D plasma. "Today we are now unveiling a complete home ecosystem: 3D TV, Blu-ray player and eventually home audio system. "This will deliver the complete cinema experience at home." Like Toshiba's Cell TV, Samsung have also unveiled that its 3D technology means that its TVs will be able to convert 2D pictures in real-time. "We have the slimmest screens and the deepest 3D. This includes a built-in 3D processor and frame-rate conversion technology. "Our 3D processor can convert 2D content to 3D in real-time. So, it can convert 2D DVDs and the like in real-time. "Also, the processor is compatible with broadcast standards and Blu-ray standard." The pencil-thin 3D LED TVs on show (namely the UNC9000 series) were stunning to look at. Once the applause and cheers died down in the press conference – by far the biggest cheer for a 3D TV we have heard so far at CES 2010 – Baxter laid out Samsung's confident outlook for the future of 3D TV. "Just as we created the LED market last year, we will lead the industry in the 3D market this year with the widest range of TVS – LED, LCD and Plasma TV." From what we've seen so far, Samsung look well-placed to bring 3D to the home in 2010 in the most stylish way possible.